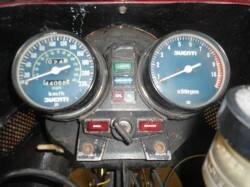 The new single overhead-cam engine used Ducati’s desmodromic valvetrain to open and close the two-valves per cylinder, but used toothed belts instead of tower shafts to drive the cams. This change did not increase output or reliability to any significant degree: it was intended to decrease the substantial production costs of the bevel-drive motor and reduce mechanical noise. While obviously much smaller than the earlier L-twins, the specs for the new motor were impressive: it put 50hp [46hp at the wheel] through its 5-speed gearbox and boomed its way to a top speed of about 115mph. 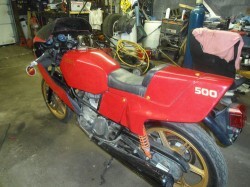 A 600cc version was introduced in 1981 and a 650 was eventually offered. 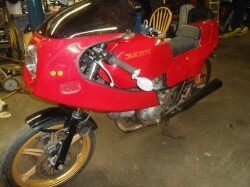 The 650cc version ended up in the Cagiva Allazurra once they’d purchased the Ducati in 1985 and, bored out to over 1000cc’s, the engine powers today’s air/oil-cooled Ducatis, making it an extremely long-lived design. 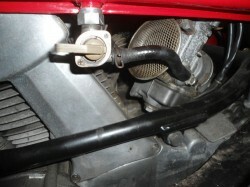 The Pantah also introduced a number of other features that became Ducati hallmarks in the years to come: a trellis frame that used engine as a stressed member and a swingarm mounted to the rear of the engine. 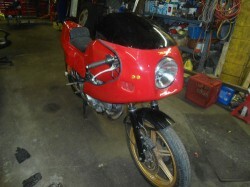 European Market bike imported from the UK, euro paperwork also, never registered in the US. Bike not ridden or started in 5 years, wouldn’t take much to make her roadworthy again. Very good red body work, windshield is cracked missing some hardware. Metzelers, Conti 2 into 1 pipe, Brembo brakes all around. 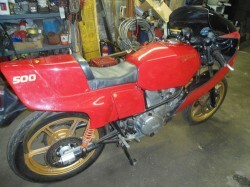 Vintage race this and/or create a TT2 or NCR tribute bike. Lots of potential. Shipping is buyers responsibility. The belt-drive motors may have been cheaper to produce, but maintenance costs remained pretty high: belts should be replaced every 2 years or 12k miles, valves checked and adjusted every 6k. But a handy mechanic can do most of the necessary work and, electrical foibles aside, the basic engineering is very durable. The motors respond well to tuning, parts availability should be excellent, and the styling will garner plenty of attention. Do you still have the Pantah for sale? If yes, any options to ship it to Portugal?